Two very different compositions are presented on this CD: the F-sharp minor Sonata, which Schumann described as “a single cry from the heart” for his beloved Clara, is conceived on a grand scale with tremendous sweep and passion. The multi-movement Humoreske flits from one mood to another, presenting us with an image of the composer’s mind at the time. 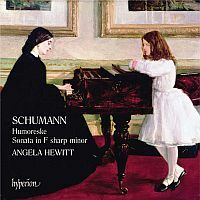 The recording was made on Angela Hewitt’s own Fazioli piano.